Comforter set consists of a 66 x 90 inch comforter, a tailored 15 inch drop split corner bedskirt, and one standard sham, 20" x 26" by Thomasville Home Furnishings. Vine and leaf print in shades of black and grey with touches of taupe. 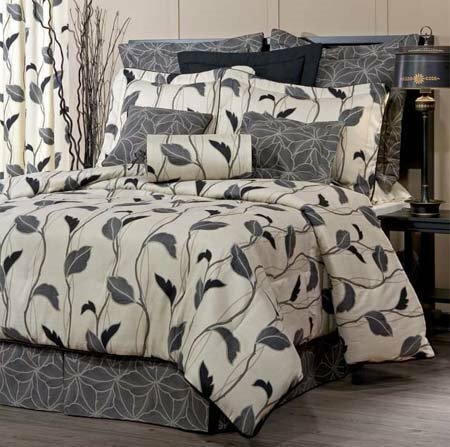 Comforter reverses to darker leaf pattern and has black piping at edge. Sham has flanged border with black piping at edge. Polyester/cotton blend. Dry clean recommended. Manufacturer UPC is 013864106429.